Although the 2018 crypto bear market seems to be fraught with bad news, there have been some less obvious benefits. As it turns out, the decline in Bitcoin prices has been increasingly beneficial to the development and functionality of the Bitcoin network. Over the past few months, the Bitcoin network has been developing into a more robust form thanks to new solutions like SegWit and the Lightning Network. 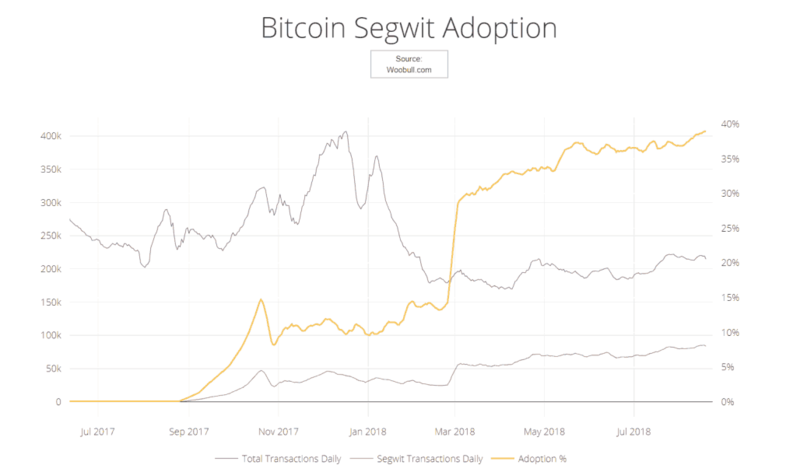 SegWit (short for Segregated Witness) is an upgraded protocol that aims to solve the scalability problem by changing the way information is stored on the blockchain. It was first introduced to Bitcoin in August 2017 but has slowly increased in its utility during the bear market. The maximum block size on the Bitcoin blockchain is 1 MB, which restricts Bitcoin to only being able to process 7 transactions per second. SegWit was initially developed to solve a bug in Bitcoin’s code that allowed anyone to make small modifications to the transaction ID. SegWit fixed the problem by removing signature information from the main transaction block and storing it outside. Removing signatures also helped reduce the weight of the block, allowing more transaction data to be input, which helped increase the speed of confirmed transactions. The Lightning Network is another Bitcoin ‘layer 2’ scaling solution. Using the Lightning Network smaller, less significant transactions are stored ‘off chain’, and are essentially bundled up and validated independently by small communities before being sent back to the main blockchain, where they can be processed as one single transaction. The Lightning Network is currently still in development and may take more time before gaining a higher adoption rate. What’s going to happen on the next run to $20K? When the next bull run occurs is anyone’s guess, but as these solutions continue to strengthen the Bitcoin network, we can be sure that another run up to $20K per BTC will provide a much smoother transactional process for everyone. The post Has Bitcoin Scaled? Is Bitcoin ready for the next bubble? appeared first on CryptoPotato. Next Next post: Can insurance coverage for crypto assets attract more institutional investors?